I wanted to share some more info about the anthology that I will be published in and helped proofread. 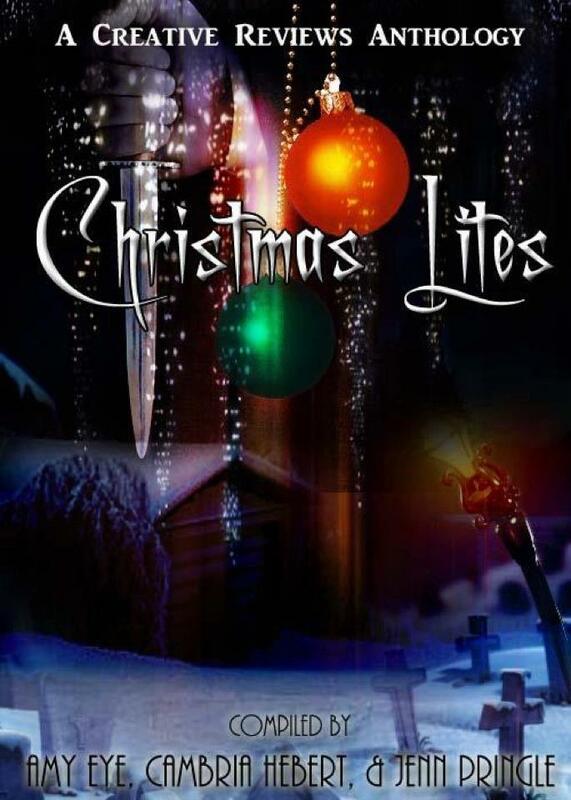 Christmas Lites will be arriving Nov. 26 in eBook format and print format. An eBook copy will be available at Smashwords and only run $3.99, and all of that will go to the charity. The print version will run $12.99, with the greater percentage of that going to charity if you buy from CreateSpace. The print version is also available on Amazon , but I encourage you to use CreateSpace so that the maximum percentage can go to charity. Its a great deal really – the reader gets a great read AND someone in need gets assistance. So without further creative ado, here’s the general information packet we came up with, including author’s names and story titles and a little bit of info on NCADV. The Creative Reviews group on GoodReads is filled to the brim with writers, reviewers, editors, proofreaders and crazy people. We decided to pull all our abilities to do something for others. And it was born: Christmas Lites. 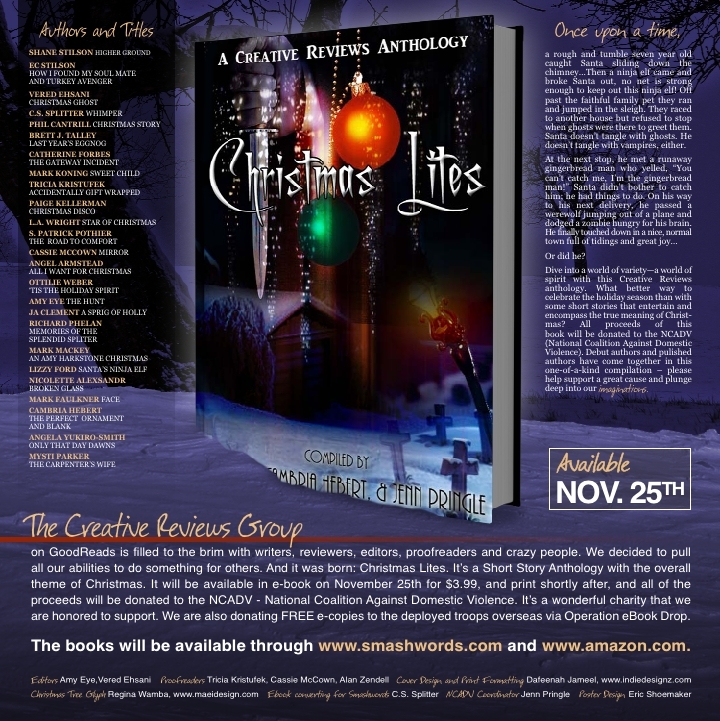 It’s a Short Story Anthology with the overall theme of Christmas. It will be available in e-book and print this November. Twenty-six authors submitted a short story to be included in the anthology and the proceeds will be donated to the NCADV – National Coalition Against Domestic Violence. It’s a wonderful charity that we are honored to support. We are also donating FREE e-copies to the deployed troops overseas via Operation eBook Drop. Tricia Kristufek: Accidentally Gift Wrapped <—-That’s me!!! Proofreaders: Cassie McCown, Alan Zendell, Tricia Kristufek <—- That’s me again! NCADV’s work includes coalition building at the local, state, regional and national levels; support for the provision of community-based, non-violent alternatives – such as safe home and shelter programs – for battered women and their children; public education and technical assistance; policy development and innovative legislation; focus on the leadership of NCADV’s caucuses developed to represent the concerns of organizationally under-represented groups; and efforts to eradicate social conditions which contribute to violence against women and children.to violence against women and children. Please start passing on the word about this wonderful book. A LOT of effort went into creating this in a very short amount of time, and everyone who contributed in one way or another is very proud to be a part of this project. They would make wonderful stocking stuffers for all your book-lovers, and you get to help others during this season of giving as well. If you have any questions, please feel free to leave me a note and I will get back to you. Update: My coworker, Eric Shoemaker, made this wonderful book release poster for us to use! If you ever need any graphic design work, he’s the one to go to! Just shoot me a message and I’ll hook you up. How awesome! Definitely getting a copy!! Your friend is super talented as that is one fabulous looking poster! Wow! It makes me want to buy it! Lol. Great idea tricia – you are fab! !